Beginning July 1, the San Diego Unified School District has announced it will no longer keep emails longer than six months and employees are responsible for retaining emails to be saved on a local computer drive. The change, according to the district, is part of a long-term strategy to save money and is in preparation of putting out a request for proposal (RFP) for new servers this fall. SDUSD’s Executive Director of Internet Technology, Greg Ottinger, could not provide an exact number of what the cost savings would be but said he expects it to be in the millions. According to Ottinger, the district fields more than 60 million emails a year, which he said is “exceptional” for a district the size of San Diego Unified. In San Diego, the release of emails has helped shed light on illegal activities, including the investigation into the actions of now former SDUSD board member Marne Foster. In December of 2015, the district launched an investigation into Foster, who was accused of abuse of power. The San Diego County District Attorney’s office also investigated. Ultimately, Foster pleaded guilty to a misdemeanor and, as part of the plea deal, resigned from the school board. Tinkov said the Foster case is a good example of why it is important to keep records for an extended period of time. He said the district’s new policy is a transparency problem in the making. “What it really does is simply shrinks that down to a six-month period, and that's a real problem,” Tinkov said. In California, any member of the public can ask for information like emails under what is called the California Public Records Act. It is used to hold the government and its employees and entities acting on its behalf accountable. Other public agencies in San Diego have taken steps to change their retention policies regarding emails. The policies vary from agency to agency with some keeping emails for a few months, others for two years. 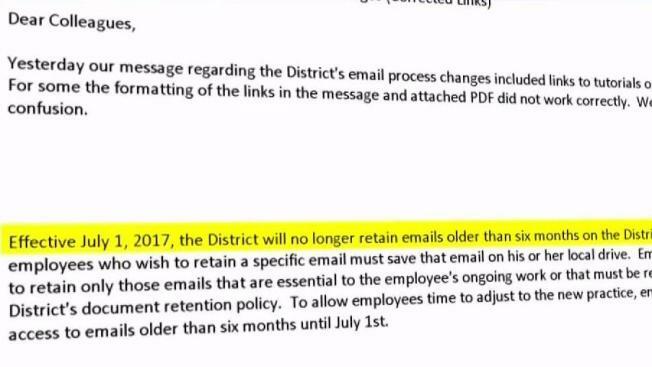 Under the district's new policy, emails will be permanently deleted after six months unless they are flagged by employees to be saved. Other documents produced by the district, like student records, budgets, and business operations, will continue to be saved permanently as required under the California Education Code. Section 35253 of that code does provide “the governing board of the district” permission to destroy records according to regulations the Superintendent puts in place if the destruction of the records is not prohibited by law. According to the district, it will be giving employees guidelines about what to save to their local drives and what to delete through new administrative procedures that will be implemented on July 1. Those procedures will then be ratified by the School Board at a public meeting shortly after, according to the district. Click here to read the district's current administrative procedures. A representative with the teachers union told NBC 7 Investigates it understands the district’s need to make a policy change, but it would prefer the emails be kept for one year rather than six months. The representative also said the union would like the policy to take effect in September rather than July, providing teachers more time to adjust to the change, especially given many will be on summer break. In addition to relieving the burden on the district’s servers, the email retention policy change is also going to help increase its response time to public records requests by eliminating the need to search through all of them, according to the district. Click here to read the full statement from SDUSD. With the new policy, “emails will no longer be available after six months,” the IT email reads.